WD Gold data center hard drives are designed for a broad range of applications – including small to medium-scale enterprise servers and storage, and rack-mount data center servers and storage enclosures. It has a new, high-capacity configuration of up to 8TB that offers HelioSeal helium-technology for performance, ideal capacity per square foot, power efficiency and low power consumption for data center environments. •Improved power efficiency - New electronics enhance power efficiency up to 15-percent. HelioSeal technology enables up to 26-percent lower power consumption. •Better performance – Up to 18-percent sequential performance improvement over previous generation WD Re™ 4TB datacenter drives, and up to 30-percent improvement in random write performance over previous generation WD Re 6TB datacenter drives through media-based cache, and up to 3x improvement over competitive offerings. 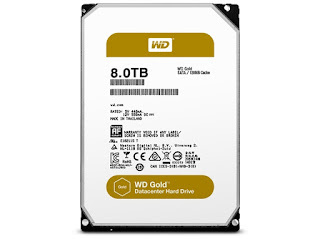 •Dedicated Premium Support Line and WD Gold Model Numbers – Western Digital offers a 24/7 premium support line for WD Gold customers.